Thank you dear friend. I miss you. One of our first counciling sessions Phil and I went to in the 70’s, the counselor told us to drop should from our vocabulary. I don’t know if eliminating should is the correct way but griefing for me at this time is hard. I don’t think there is a right or wrong way and everyone grieves differently. I’m so sorry that you’re grieving. And you’re absolutely right-there is no right/wrong way. We grieve as we love-differently. Virtual hug to you. Your words are filled with so much wisdom and honest experience. Thank you. Thank you Sunnyrains–love your name. This is so well written and speaks directly to me, even though I can’t say I’ve experienced such a loss. I am definitely going to pick up a copy of Joan Didion’s book. You should look into The Four Agreements. It isn’t 100% relevant to your situation, just life and how to make the right “agreements.” You are inspiring!! Chiara, thank you so much. I love the Four Agreements! Roy, thanks for your kind words. I’m going to (try to) apply the message of eliminating should in my daily routine. Although I am not grieving a loss right now, the constant feed in my head telling me I should be doing something else is distracting. Yoga helps to live in the moment. Focus on your breath. Joyce, yes, it’s a great practice that falls over into any part of life. As some of us therapists say, stop shoulding all over yourself! Thank for this great post! For me, I’ve definitely had to remove all the shoulds from my grief, trauma and recovery process. Thanks, Justine, I’m thinking of putting up a “should” jar, like a “cursing” jar! Think of another word, like tangerine, or rainbow, each time you say or think should, substitute. And it’s mini steps every day for as long as it takes…. That made me smile!! Maybe unicorn? This is so good. I recall one of the lines from the book You can heal your life. “I would like to take the word ‘should’ and remove it from the vocabulary forever”. Thanks, Shami, and I love that idea. Think of what we could replace it with! I have been widowed since April 23 2003. I never thought of eliminating the word should, that is an excellent suggestion that I will try. I wish you well on your journey, and offer hope. I still try to live each day one at a time, and turned to group counseling using a mind fullness based approach. Hi Sarah, thanks for taking time to stop by and comment. One day at a time is always good advice–for grieving, working, even dieting!!! Thank you for sharing your story. I have told people for years not to should on themselves. It is a default habit we pick up when young. It’s a little difficult to shake but you are working on it. Tell me about what is stuck inside regarding Roger. Thanks, Denise. Yes, some child practices are hard to break, or reinvent. I certainly hope and pray for you that the days, weeks and months of feeling better increase and the grief turns into a warmness and smile in your heart. Thanks, Mary, that’s so sweet of you. And thanks for stopping by. I lost my father, Roger, nearly a year ago and every day feels like the first day. I keep being told things should be better or “that was almost a year ago” and I can’t help but feel like the wound is fresh. Thank you for your words and advice. I’m so sorry for your loss, gigi. Just a year ago? That’s a very fresh wound. Things “shouldn’t” be better. How can they be better when you’ve lost your father. They will, though, become more bearable. I promise. I agree wholeheartedly. And what a beautiful quote from Aries. Thank you for sharing your journey. Thanks so much, Lisa, and thanks for stopping by. I can not even begin to explain how appropriate this message was for my life today. Awesome post. Thanks so much, and I’m really happy that it resounded for you today. This is such a great price of writing and has really made me think differently about dealing with a lot of things that life throws at you. Thank you for writing this, it is very true. I think grieving happens differently for each person. I lost my father a little over a year ago. I sat at his bedside, held his hand and watched him take his last breath. I still wake up sometimes in the middle of the night, reliving thst memory. I’m watching my mother struggle with the loss. It’s not easy, that’s for sure. Thank you for sharing your thoughts. Mike, I’m so sorry for your loss. It took me several years before the reliving of that night finally started to ebb. In some ways I think it’s a way to hide on a little longer. Same wavelength…I’d just finished commenting on your beautiful MD post. Thanks for stopping by and taking the time to comment. Glad to have found you! this is very encouraging ! Reblogged this on Global Warning. This is a really beautiful post, so so true! Thank you so much, Desire. At least you have crossed “I should write how I feel” off your list. Hopefully, that doesn’t come off as sounding trite. You ARE capable of articulating how grief affects you personally. That is a HUGE step. I appreciate you sharing this part of your relationship with Roger. Your words are valuable. May each day bring more strength. Ed, thanks for this lovely message. Awesome post. 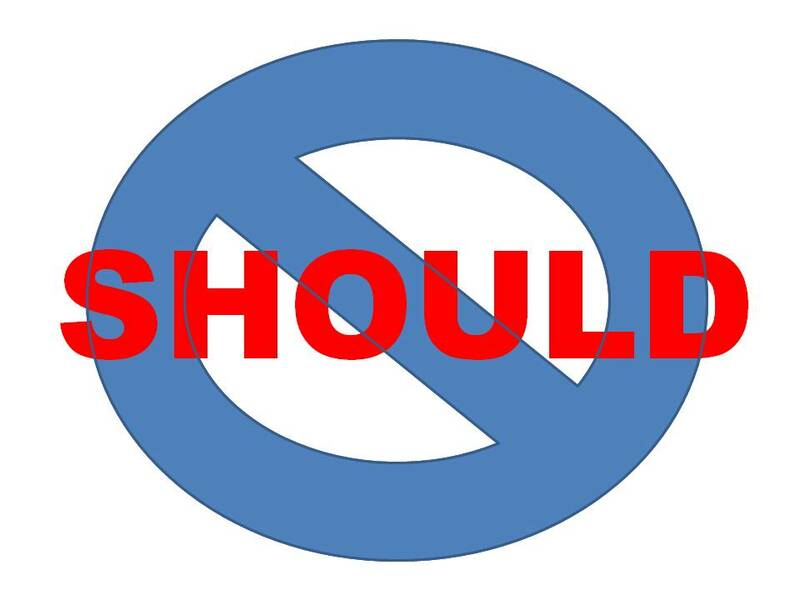 “Eliminate shoulds” is definitely the right thing to do or, at least, don’t let them pile up until they weigh too much to be removed. I made that mistake and got to the point where I thought it easier to eliminate myself rather then them! Luckily, I failed and that was long ago, but I can still remember how it felt. Hang in there, you have a wonderful means to help your healing: writing! I’m so glad you failed! Thanks so much for stopping by, and thanks for your inspiring note. That was great! I will share it with my ALS surviving spouse group. Just what we talked about last night! I just today moved my old blog over to WordPress and I found this post while browsing. It speaks straight to my heart. I lost my fiancé just over 2 1/2 years ago now, and on top of my grief I have other mental illnesses to deal with. But reading your post helped me realise that it’s okay to still feel the loss, it’s okay to still hurt, to still cry, to still mourn, because something huge was taken from my life, and everything had to change because of it. There will always be a piece of me missing from now on, but I cannot fill it with the things I SHOULD have done or SHOULD be doing, I should fill it with memories and dreams of everything we were and meant to each other. So thank you for sharing with us such a beautiful and inspiring post. Thanks for taking the time to respond. I’m so sorry for your loss. Do and feel whatever YOU need. Don’t worry about what others tell you. And be kind to yourself. Physically, grief is exhausting and debilitating. Virtual hugs to you, EmJaye. I’m so sorry for your loss. Thanks for taking the time to comment. Thank you for sharing your truth, it will help light the way to the healing of countless others. Thanks, Katie, for your kind words. YES!! My mother is always correcting me when I say “should.” There is only “could,” and this is true in all aspects of our lives. Keep doing the work. You are loved! Thanks so much, Kristen, you have a wise mother! Just found you while skipping on by and I stopped. I live without should whenever I remember to, which these days is most times. Expectations on emotions or a process seems downright silly at this point in my life, Even if I know I should, it doesn’t mean I will, it just makes me feel bad when i don’t. so no more. Thank you for sharing such wonderful thoughts and feelings. Thank you. I will check Holmes out. Reading C.S. Lewis A Grief Observed helped me some but I still remain mired in my grief. My husband and my life as I knew it has been gone nearly four years now. While we have become accustomed to his absence it is still palpable. Should is a dirty word and we just get by each day. The only consolation is that we aren’t alone in our grief. Excellent words, I’ll definitely apply this in my life as well. Thanks for sharing. Even through hurt, your wisdom shows. Should, presupposes that there is some “other rule” that would be properly applied. The word serves only to convince yourself that there is some other way, if only you could know it – as self flagellation. Further it is used as a a weapon to coerce another into believing that they only somehow know the truth. —— Eliminate the word “should” from your vocabulary. Thanks for stopping by. I like the idea of “verbal self flagellation”!